The SBL editorial board includes Sidnie White Crawford (University of Nebraska-Lincoln), Ronald Hendel (University of California-Berkeley), Michael W. Holmes (Bethel University), Robert S. Kawashima (University of Florida), Jennifer W. Knust (Boston University), Judith H. Newman (University of Toronto), and Eugene Ulrich (University of Notre Dame). In addition to the editorial board, more than fifty scholars will contribute to the review, which will be conducted over the next three years. Participants will draw upon new tools developed after the NRSV was published, including The SBL Greek New Testament, edited by Michael W. Holmes (2010); SBL Press’s The Hebrew Bible: A Critical Edition, edited by Ronald Hendel (2015–); and the German Bible Society’s Biblia Hebraica Quinta (2004–), The Greek New Testament, Fifth Revised Edition (2014), and twenty-eighth edition of Nestle-Aland’s Novum Testamentum Graece, as well as volumes from GBS’s Editio Critica Minor [sic] produced by the Institut für neutestamentliche Textforschung and based on recent New Testament methodological developments reflected in the INTF’s Coherence-Based Genealogical Method (see Tommy Wasserman and Peter J. Gurry, A New Approach to Textual Criticism: An Introduction to the Coherence-Based Genealogical Method [SBL Press, 2017]). RSV: If I say to the wicked, `You shall surely die,' and you give him no warning, nor speak to warn the wicked from his wicked way, in order to save his life, that wicked man shall die in his iniquity; but his blood I will require at your hand. NRSV: If I say to the wicked, “You shall surely die,” and you give them no warning, or speak to warn the wicked from their wicked way, in order to save their life, those wicked persons shall die for their iniquity; but their blood I will require at your hand. They could almost fix it by removing the comma, but "give" is too far apart from "speak" for that to work. The NIV is the only translation that is really successful at avoiding "nor" here, and it does so by shortening the phrases to get the verbs close together: "and you do not warn them or speak out." I hope they fix Ezek 1:27 by ditching that ridiculous expression "enclosing it all around" regurgitated by English translations for five centuries now, for no apparent reason, for the simple and straightforward Hebrew phrase בית־לה. I hope they fix the parts where stylists overrode translators and neutered language that was clearly masculine in the manuscripts. Neutral where the manuscripts are neutral or intend neutrality is fine, but neutering masculine or feminine language where it is very clear can be problematic. Amen. Render masculine pronouns as masculine per the Hebrew or Greek, and do not go the way of the updated NIV or NLT. I have painstakingly crossed through mistranslated passages in my NLT because of their penchant for neutralizing gender. Shame.. I really don't see the point to this. The NRSV is such a niche, dead-in-the-water version as it is. An update to it will simply further divide an already shrinking market. Why not just let the NRSV die in peace and use one of the other various modern versions like the NIV, NET, ESV, or NABRE? We have so many as it is. Why invest millions of dollars into a translation that will certainly flop and definitely not compete with the NIV? I do like the NRSV a lot, but nobody outside of a few academic and clerical circles actually uses it. You're kidding right? 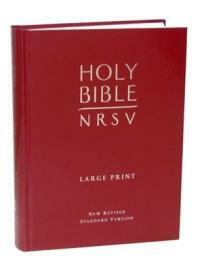 NRSV is the primary American translation in both mainstream & liberal denominations. Evangelicaland goes back & forth with NIV, NET, & ESV; but not the rest of the Church. I have almost never see someone actually use the NRSV, and polls and sales figures support that. I have seen lectionaries use it, some pastors, some academics, etc., but I have never seen general audiences use that version. If I take the NRSV to church, it may line up with the lectionary, but it will likely not match what actual Bible readers are using. The NRSV is the Bible of the 1% essentially. Meanwhile, the KJV and NIV are all commonly found in Protestant churches, and the NABRE in Catholic ones (though most Catholics I have come across do not read the Bible regularly). Lance is right Kevin. In the Church of England it is the nearest thing to a default there is. Those who use the morning prayer app all read it etc. An upadate, then, is of great significance to Anglican circles at least. I don't think Anglicans are quite dead in the water yet! Wonderful news. Let us hope those with a social agenda are out in the back seat this time and this is about biblical scholarship. “Mainline” is probably the more accurate word—it’s conventionally used to refer to the Protestant denominations (UCC, ELCA, PCUSA, UMC, DoC, TEC) that at one point held a dominant position in American religious culture. Nowadays, of course, evangelicals and Catholics are pretty much neck-and-neck (depending on which polls you consult) for the “Mainstream” designation. “Nones” are gaining fast, though. Nevertheless, it certainly is true that the NRSV is the standard among the mainline and in non-evangelical academia. Which means that even though it gets fewer eyeballs on a weekly basis than, say, the NIV, there’s enough institutional support for it that it’ll find an adequate market in its current spheres of influence. Fully agree with you, Lance. NRSV is a much more solid work. Look forward to the update, as long as the work is faithful to the long-known and more recently unearthed ancient texts. "I have almost never see someone actually use the NRSV, and polls and sales figures support that." I agree. We should measure the value of all texts by their sales figures. Evangelicalism’s marketing wing can distort the market. I have frequently found that the “Religion” and “Christianity” sections of mainstream secular bookstores are dominated by evangelical and prosperity gospel twaddle, and the Bibles for sale range all the way from NIV (girls edition with pink cover) to NIV boys edition (with camo cover) to NIV random niche edition (with random niche specific cover), plus one or two copies of the AV. But no mainstream scholarly translations at all. Malcolm, one can obviously look at facts in various ways. I too bemoan the dominance of marketing over principle within evangelicalism. However, I think that there is a lot of ideological loading in the term 'mainstream' which you use. If one does not use numbers (and I'm not suggesting we should), who decides what's mainstream? There's plenty of marketing that goes into promoting ideas about the Bible by those other than evangelicals and there are plenty of ideas promoted by those who self-designate as 'mainstream' which are decidedly odd from the perspective of beliefs Christians have held over a long period. I also think that there's danger of guilt by association when you write 'evangelical and prosperity gospel twaddle'. Evangelicalism as a movement has more than enough fluff, but I think that some of the contributors to this blog are part of the testimony that there are more weighty intellectual perspectives within the movement too. They should drop that entirely and just use SBL or something in the title. Like their Greek and Hebrew SBL source texts. In addition, the Hsrper Collins Study Bible is already written by the SBL. Might as well call that the SBL study bible too. That's just my 2c. The vast majority of parishes in The Episcopal Church (USA) use the NRSV, as does the Church of England in its Common Worship lectionary. I'd daresay (and I admit this is a guess) that NRSV is the standard English translation in mainstream seminaries at least in the US. As of today (1/27/2018) the Oxford Annotated NRSV is #4 and beats out, for example, the ESV Study Bible, for most copies sold. So it's a but much to claim this revision is to a text that is a "niche." I'm not sure that being "up-to-date" on textual criticism will necessarily help the NRSV. The context doesn't matter. We have to speak or hear of the "brave men and women who fought to preserve freedom" in WWI and WWII, just because the military is now co-ed. Anachronism is, it appears, ubiquitous to every age. If they fix the problems introduced by the editorial board and stylists of the NRSV, it will be worth an update. I loved the RSV and was very disappointed to see what the PC NRSV had done to such a majestic and accurate text. So I just couldn't bring myself to use it even though most of the verses I had committed to memory were from the RSV. Then Ignatius Press came to the rescue with the RSV Catholic Edition, which updated the RSV and eliminated archaic language in the NT. Now Ignatius has the entire RSV-CE2, which includes an archaism-free and textually updated OT. I bought the large-print edition and had it rebound in leather sans Apocrypha to relieve it of some of its unwieldy bulk. The cost was worth it to me. I hope the committee change the words of sheol and hades to either hell or the grave. Also change the measurements to English standard rather than metric. Also add forever at the end of Psalm 23; add Christ to Phillipians 4:13 instead of him. Don't you mean Queen James? King James died in March of 1625. Hard to stick to a dead guy. In 1997 I sent Bruce M. Metzger (for whom I wrote my thesis at Princeton Seminary) 2 pp. of suggested changes for NRSV: "COMPASSION" (for "pity" Lu l0:37); "RECKLESS" (for "dissolute" Lu 15:13); "GOD'S WORK OF ART" (for "what God has made us" (Eph.2:10) etc. I have always treasured the Revised Standard tradition. The NRSV is truly a great translation that I trust will become better yet!